So I got a note about this awhile back, but I am lazy and/or busy so now of course it is almost over, but not quite! And anyway this is a steampunk sort of place that I hadn’t run across before, and those are always fun. Click through the poster above there for details, or go to the page via this link here. Pleased to announce the opening of another show by Callipygian Christensen, SL photographer and DJ and generally whip-smart and wonderfully creative person. As you can see in the comely picture there, the show is called “Body of a Woman”. As you probably can’t quite read, it will run from July 26th (that’s tomorrow! or actually today! depending!) to August 22nd, in the Palais Orleans Photography Studio, located in Tasogare. The Photography of Prandi Capalini – show opening! Art opening tomorrow! You should go! Everyone will be there! From his first postcard to Snapzilla 6 months ago, Prandi has provided a unique view of Second Life through the eyes of an old wandering sailor. Saturated monotones and exceptional use of light give his images the feel of a different time and place, and lead the viewer to wonder what story each one shows us a glimpse of. With over 900 images now shown on Snapzilla, Prandi has selected his favourites to be shown inworld for the first time. The Fashion Research Institute invites you to the opening reception of this exhibit on Sunday Nov 1st from 11 AM – 12.30 PM SL time. Drop by and meet the artist, and enjoy viewing his work in the tranquil tropical setting of Shengri La. If you cannot attend the opening, feel free to drop by the gallery anytime and enjoy the exhibit. It gives me great pleasure to pass along this here announcement of the opening of a new show of works by the extremely cool Marianne McCann! 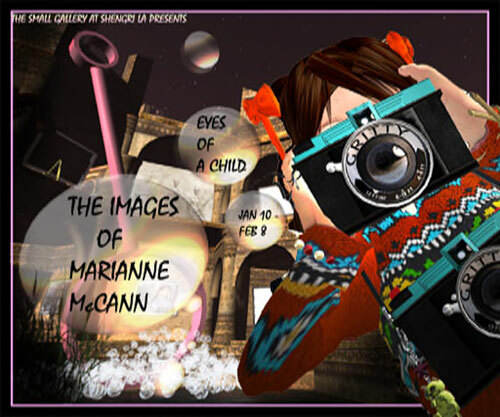 The Fashion Research Institute is proud to present “Eyes of a Child”, images by award-winning SL photographer Marianne McCann. Marianne McCann is a child avatar in Second Life. Coming in-world in the later part of February 2006 as a fairly standard adult avatar, Marianne soon developed into the “inner child” of her player. Marianne was involved with builds within the Second Life’s Third Birthday Event and Fourth Birthday Event (the latter largely created by Loki Eliot) to focus on the “lives” of child avatars within Second Life. There were some difficulties with the Fifth Birthday event, with both Marianne and Eliot initially being “respectfully declined” from participating, then reinstated less than a week later due to public outcry. McCann has attempted to provide a “face” to SL’s “Inner Children,” and is an officer of Second Life Children. In October of 2006, Snapzilla spotlighted her extensive collection of in-world snapshots. She also was chosen as the winner of the 2006 Bubbly Kids in-world beauty pageant, is a graduate of HardKnock Elementary, and helped to create a public park on Info Island. In November of 2007, Marianne won the 2007 Uncanny Valley Expo contest sponsored by New World Notes. This led to a sizable interview on the use of child avatars in Second Life. She also writes for the Metaverse Messenger on child avatars. Join us for this exhibit of Marianne’s work, including her entries in the Bay City Visions contest. where she took second place with her image ‘Little Girl in the Big City’. Marianne will be at the gallery for an opening reception on Saturday, January 10th, from 12 noon to 1.30 PM SL time. The exhibit runs from January 10 – Feb 8 at the Small Gallery, Shengri La.